My great-great grandfather, William Davis, and his wife Rose lived in Box. At various times the censuses mention Box Hill, Box Quarries and Quarries. He was born in approximately 1804 and died in 1885. His wife Rose was born in approximately 1802 and died in 1890. I am descended from his son, Charles Davis, who was my mother's grandfather. I have a print out of Romany Records entitled "1881 Wiltshire Basket Makers".. There are 111 Wiltshire basket makers named on the index. This fascinating snippet of information set us on a search for William and his family and for rural handicrafts in Box, an essential feature of Victorian Box separate from the regional manufacturing businesses featured in an earlier issue. At first we thought that William was one of the squatters at the quarries on Box Hill, probably non-conformist, and making baskets for use in the stone works. But it soon became apparent that this was incorrect. 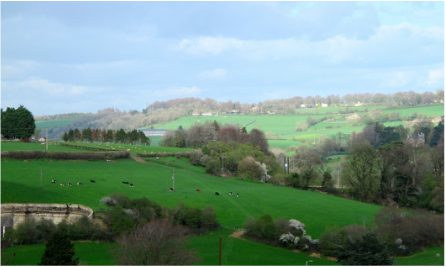 But we know that they were local people and both William and Rose Tavener come from villages neighbouring Box, North Wraxall and Biddestone. William Davis (tenant and owner) of cottage, basket-maker’s shop and garden. The record gives the precise reference to his property at entry 385b, sited next to property 384. 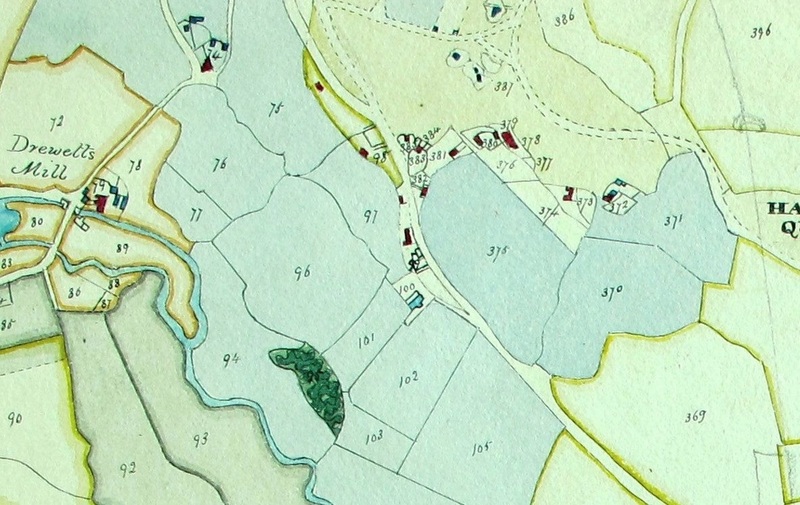 Left: Extract of map of 1840 produced for the Tithe Apportionment (courtesy Wilts History Centre). We might assume that he was reasonably wealthy because basket-making was a vital part of the economy. We forget that everyone needed baskets for transporting valuables, rubbish and for conveying raw materials to industry before the widespread use of plastic and metal. William continued his trade for decades and is listed in the same location on Box Hill Quarries in the censuses of 1841, 1851, 1861, 1871 and 1881. In 1861 his house was identified as By the road, meaning built alongside the new road (now called A4) constructed in 1761. We know a little about his family. He married Rose in 1827 and their children included: James (b 1828) described at times as a journeyman mason; Caroline Abbott (b 1831), who may not have married as she is still with her parents in 1881; William (b 1833) who followed his father into the basket-making trade; Thomas (b 1835), a man servant; George (b 1838); Frederick (b 1840); Robert Harry (1842 - 1878); and Charles (1845 - 1919). 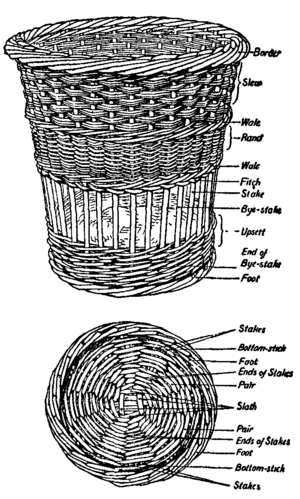 One type of basket which was illustrated in the Encyclopaedia Britannica of 1911. What Baskets Did William Make? We might assume that he made many different types because he was gainfully employed in the industry for so long. But these were not decorative items as we use them now; they were vital commodities in late Victorian industry. William's location might indicate that he provided baskets for the quarry trade and his eldest son being a journeyman mason adds to a possible link. In this event he probably used willow because of its strength. He might have sourced this from the banks of the By Brook, where it was abundant and on common ground. Somerset was an abundant supplier of baskets and it is probable that William sold locally, perhaps to the candle factory which needed baskets to pack their goods for storage and for transporting them. How Profitable was the Business? The long period of time that William and his family worked in the trade, and the number of children it supported, implies that it produced a good profit for the period. We can go further. By chance we came across a legal case dated 14 April 1870 when William was obliged to sue Samuel Oatley. The case was reported as: The defendant (Oatley) resides in a house of the complainant's (William) and on the latter calling for some rent, he was pushed down by the defendant who also threatened to knock his brains out. The case was decided in favour of William and Oatley had to pay him 20s plus expenses. William obviously had not one house but at least two. William's son, Charles Davies, was Pam's ancestor through her mother's side. Charles was also a basket maker and at some point he moved to London. I have not found out why he left Box. If anybody is able to shed light on this family, I should be delighted to hear from them via the website.